This is my staircase. White risers and spindles, black treads, and an ornate wooden banister and newel post (which my mother painstakingly removed layers of thick, brown paint from). I keep going back and forth on whether they need a runner or different paint or…something. 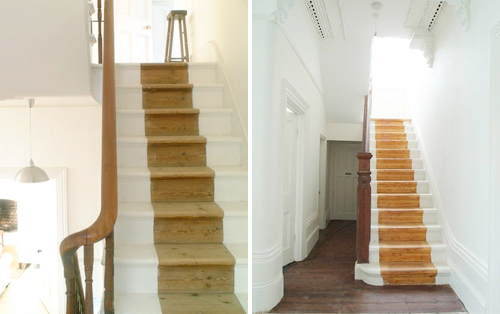 The photo on the left with the stripey runner is what set me off on my most recent staircase-obsession. It got me thinking about the two UNNI rugs I have in my hallway right now, and how cool it would be to get five or six more and continue them all the way up the stairs. And those hot pink treads on the right?! Those are just ridiculously cute. How fancy would you feel walking up pink stairs on your way to bed every night? Pretty darned fancy, if you ask me. Okay, fantasy time! I LOVE LOVE LOVE the way these “negative-runners” look, but I can’t imagine taking the time to strip the paint off of all 16 of the stairs. Maybe I’m just lazy. Of course, imagine how easy the maintenance would be! Hmm. The magic here comes from the white floors, of course. 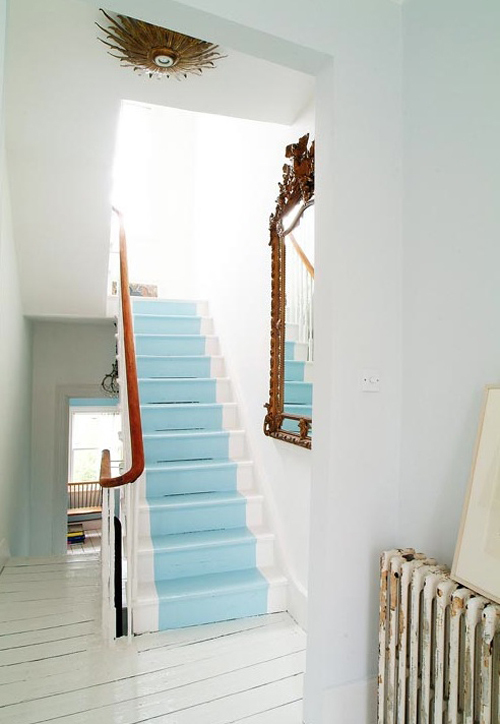 Without all the white, the warmth of the lamp, mirror, banister and radiator wouldn’t come through as beautifully, and the pale blue paint would look too wimpy. Everything about this space is perfect—I love that tiny sliver of blue wall peeking out from the room at the end of the hallway. The photo on the left is of the entry hall in Orla Kiely‘s house. When I first saw it several years ago, the concept of a painted runner was completely new to me. I think I may have called Evan at work to tell him about it because I was so excited. I’ve written about these wallpapered stair risers before, but I didn’t think this post would be complete without showing them again. Maybe not the right thing for home, but these stairs are perfect for a design studio. 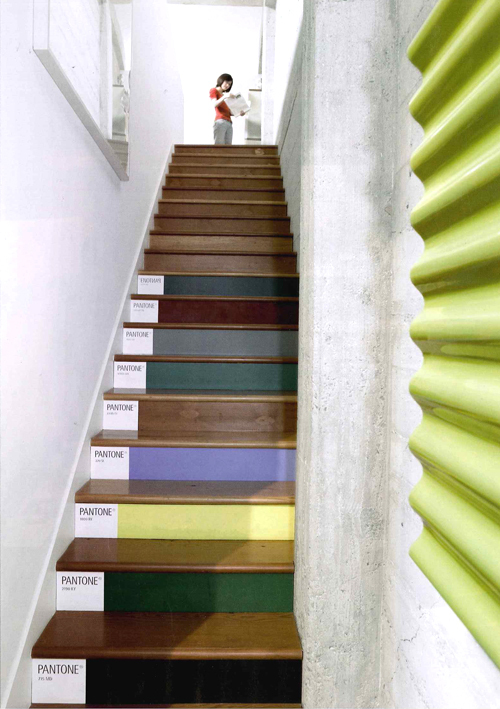 Pantone makes paint now, too, so you could color-match your print jobs on your way downstairs at lunchtime! It might be fun to paint the stairs to echo the UNI rugs, in the style of those Pantone stairs (just the fronts). Either each step, all the way up, or random ones throughout. What a happy burst of color that would be! “Welcome Home” indeed. 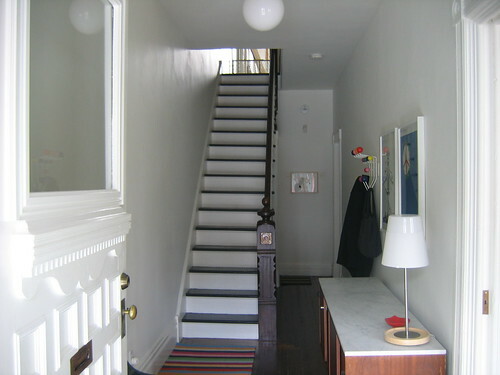 advice needed: what is your opinion on painted stairs when the floors they leave and lead to are natural harwood (last pic) and the staircase looks like yours (only with the same hardwood treads)? My favorite painted staircase I think was in vogue. It looks like a can of paint was poured down the middle. I swear I’m going to try this !! My current stairs are stained and varnished plywood that had carpet over them. I’m not sure what happened to the original stairs, or maybe those are the original ones. I have been thinking of painting them white. I don’t wear shoes in the house, so it would be just Chloe and I going up and down them. Maybe black would be a better alternative? Pink stairs=ultimate in fancy. Oh how I wish I had stairs to paint pink! not going to lie, yours is my favorite of the whole bunch! I want some stairs to paint them! Although I guess I could never make a decision…I love all of those options. But the painted runners are my favorite. Ummm, I don’t think anyone would EVER call you lazy! I like the idea of the UNNI rugs as runners, something to echo the pops of colour the Hang-It-All already brings to the entry. Having said that, the idea of wallpapered risers makes me want to DIE. If you will excuse my Rachel Zoe moment. 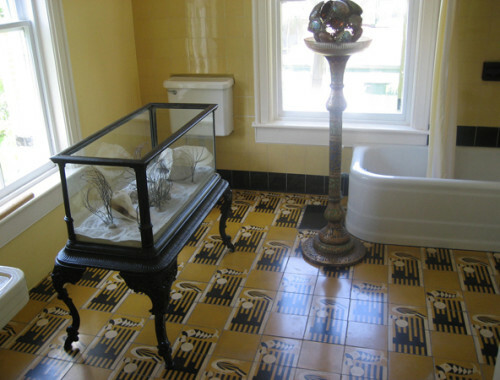 Do you have any left over wallpaper from your bathroom? I vote for covering them in UNNI rugs. I love the rainbow-stripedness against the white hallway. At first I thought they used another carpet, but after studying the color pattern, it looks like they used UNNI rugs themselves. The only thing that bothers me about theirs is the wrinkles/waves in the rug—it looks sloppy. CapreeK said what I was going to suggest! I think a painted striped runner would be adorable. Wallpaper or red painted runner – either I think would suit you perfectly, dear. Love the pic with the turquoise painted runner, absolutely beautiful! I love this post….stairs are just so full of potential…at the moment mine are painted all white and the hallway has checkered tiles….but i have been toying with the idea of painting a coloured runner…the pink above is fabulous, but i think would probably be a step too far for my other half!! Oooh, these are all wonderful! We have to redo our staircase sometime in the future and while it’s nowhere near as nice as yours is this is good inspiration for the project. I am all about the wallpaper! I must be sheltered, because I’ve never seen or even thought of that! Yours are my favourite too. I love, love, love the sugar city staircase – my favorite is that they have little photos hidden in the print. Our stairs are very similar to yours (white risers, black treads, black banister). It looks nice (so much nicer than the original wood) but I too keep thinking it needs something … more. My latest thought is some sort of runner in a geometric black-and-white print, or a subtle multi-colour stripe. 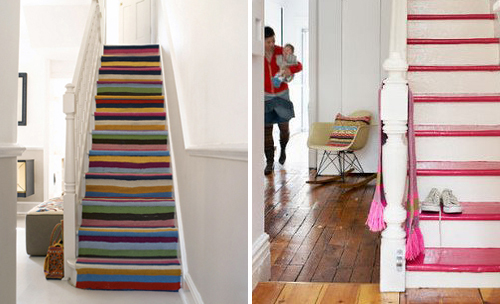 I like the idea of a stripy runner (carpet, not paint). Or just leaving the stairs the way they are, they’re quite lovely as is. Vacumming the stairs was on my chore list as a child, so I don’t believe I could do the rugs…but maybe a painted version of those stripes. I’m really liking the pink risers as well. Adam: Your hallway is so white and bright that I think black stairs would look really fantastic. 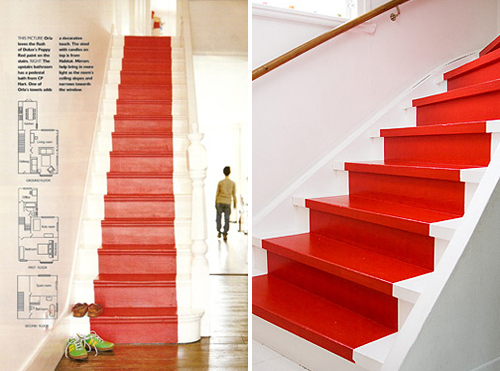 I would just do one color, though, since the stairs are plywood and (I’m assuming) don’t have any details. Just make sure you rough up that varnish before you prime, though! I think the wallpaper looks amazing! The stripes give off a dizzying vibe, in my humble opinion. I really like your setup of rainbow accents in a traditional space better than the inspiration photos. My thoughts: add a simple handrail to the walled side of the stair and paint it a bright color. It will wink at the traditional stairs without obliterating them. Then get a mirror in there to bounce around all the natural light and colors you already have. I like the wallpaper risers best! Plus, this way you could probably just leave the stair treads black. I’m a simpleton – they are beautiful the way they are and oh to be able to clean them… what a breeze. Your stairs look great – i think the room needs some added color so that your stairs will really pop. I agree – your stairs are great the way they are! I love your entry hall and don’t think you need anything else. I also thought I would mention: I imagine that a black or near black ceiling would look phenomenal in there… but I am crazy. I want stairs! Just so I could do something fabulous with them. I love the Pantone stairs…and the pink stairs. Well, any and all of them, actually. I love the multicolour runner up the stairs as well as the pink stairs…they both get my vote. 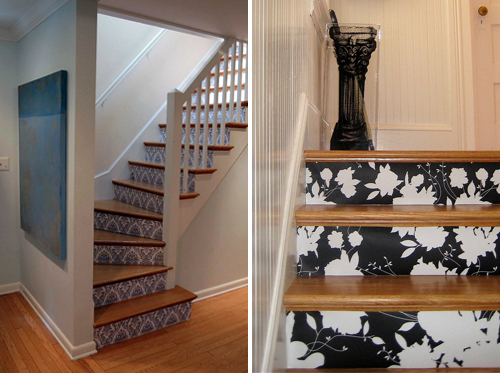 My favorite is covering the front of the stairs with mirror mosaics…just gorgeous! I won’t hold it against you if for some reason you are tempted to repaint the post and banister. Maybe it’s Fritz and Bruno barking happily when we walk in, but your hallway and vestibule feel so welcoming! Those other spaces are light-filled in a way you rarely see in hallways. Will you get more light on the staircase when/if you get that skylight put in? I have a staircase that needs help too! I love the rainbow carpet on the stairs, but I don’t have an Ikea nearby and I can’t find the carpet anywhere. I’ve tried. YOu can’t even order it online from Idea…only in stores. Anyway, I go back and forth about what I want to do with the stairs. Part of my problem is that I’m broke and the other part is that I”m lazy. I want a quick fix with minimal pain and effort from me. The pink is cute…maybe I could do red which would be more in keeping with my house…or black and white. I just can’t decide! oolala, orange painted runner, or pink steps. a friend has her stairs done in all shiny black with bright white spokes & a black railing. simple & gorgeous. i just found your site but its really cool… on the stairs, i remember seeing a set of stairs where the risers had been done with a mirror mosaic. i think it was in domino way back in the day, maybe. anyway, you could fit plywood under the risers if you didn’t want to make it permanent, but it would definitely lighten up your entryway a little. Anna, I have a similar staircase and am wondering what you and your mom used to clean off the paint on the newel post? Your hallway is perfect….and there in may lie the problem. I sense from your magazine tears that you are attracted to spaces that surprise you a bit. You think you have an owner or space pegged and …bingo…there’s something there that makes you wonder. It comes out of left field and is the piece that pulls a space together and makes it sing. I think you will find it…keep looking. You have that magic eye! mommy: No way! I would never consider painting the banister and newel post. I love the wood!! Shashi: My mother used Citrus Strip to remove the paint. There’s a good description of the process here. These are all great, especially the wallpapered ones. When I first saw your rug, the first thing I thought was — oh wouldn’t it be cool to paint just a thin strip of color under each tread, as if you’d cut the rug into separate stripes. 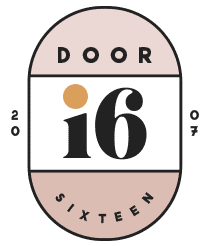 It struck me as a minimalist but still fun take on the runner idea. I love your foyer, of course, but I feel like the wall the stairs are on is begging for some art, and the stairs don’t necessarily need to change at all. Maybe a print across from the credenza or a couple hung with the incline of the stairs would balance things out a bit? Or a mirror, although I have a feeling that’s not really your taste. But! I remember a post where the wallpaper used on the risers was the same pattern you used in your bathroom reno and thought it looked amazing, although I have to say I’m not as fond of the look on the two photos above, even though I appreciate the idea. Have you ever thought of numbering your risers? yours is my fave of the bunch too! i would say leave it as is or paint the banisters and railing white to brighten it up. Makes it quieter and softer under foot. Or you could keep it as it is and paint the hall ceiling a fun colour! i’ve been contemplating what to do with our stairs to the basement and second floor for years, wow, it really has been that long. i was going to do wallpaper, but just can’t find what i want. i love the bare wood runner you posted!!! i just think it’d be too much work at this point. Is there a design or picture on the bannister post? Do you find the white risers easily get scuffed? Mine do. What about applying an upholstery fabric to the risers as you would wallpaper? 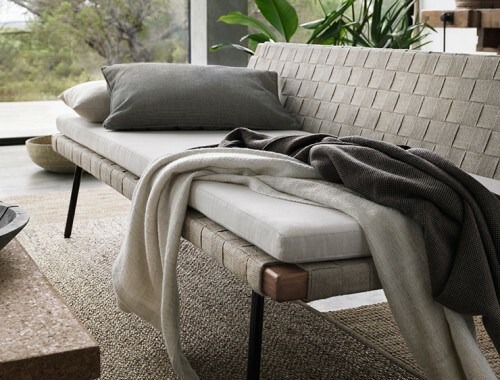 In my head, that looks warm and textured, and wouldn’t be a chore to vacuum as a runner covering the treads would. Wool sisal runner, in a natural sisal colour and binding in the closes colour to the sisal… make it easy on the eyes so the whole entrance is what you see when you open the door and not just the stairs…it is going to cost alot…keep it safe and classic. I would say, make a vista out of that wall… with a great colour and a large scale piece of art…make people want to come in an find out what is past the staircase. So many great ideas here. I love the stripey runner. To be honest, I like your plain stairs best. Some of the others, especially the negatives runners, look a little imperfect and too “crafty.” Your plain stairs look classy. There’s something about decorating stairs that reminds me of knitting cozies. A sort of unnecessary need to beautify everything. Your staircase if fine just like it is – you need something – or rather lots of somethings (mainly like pictures) on the staircase wall. A good place for old family pictures, with different frames in different sizes and shapes. 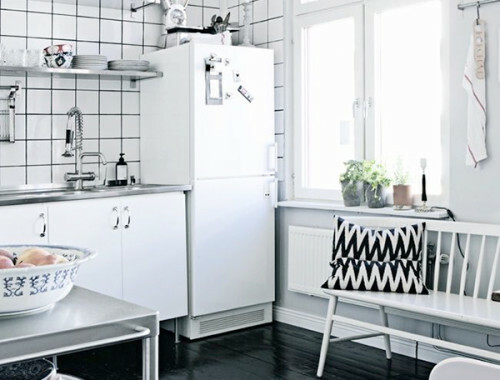 Add a few whimsey items, like an antique plate or vintage wall pockets -even old style pictures – for some contrast, and enjoy……..
Diagonal black and white stripes! What color are your walls in the staircase?? Kristen, my walls are BM Moonlight White. You can see all of the paint colors in my house here. Totally love those red stairs of Orla Kiely. Wow!!!! Unfortunately, with 4 small kids, I can’t do this with respect to our poor neighbors. SECOND – Thank you for this collection of images – it’s awesome! I just discovered your blog this morning and have spent the day reading all the old posts! I’ts fantastic. I think your hallway looks great but you need some bold colour on the stairs. I wouldn’t cover them completeley but just put some colour on the risers or something like they did on those faulous pink stairs!!! Sorry to comment twice, but i also think what Capreek (first comment) suggested about random stripes was a great idea. I like your stairs the way they are. But I wonder if maybe the hallway ceiling could use some molding. the pantone one would be GREAT for an art studio or a graphic designer, one to keep away for sure! thanks for sharing!